Well we made it to the half way point....Wednesday! Lately I have been feeling like I am taking 3 steps forward and 10 steps back...I just cannot seem to get caught up on stuff! I haven't stamped in a while, since I am busy with my digi class. I am so glad that I made a bunch of thank you cards a few weeks ago. 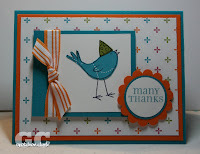 This one uses the stamp set "a little bird told me" I think it is such a cute set! I like to paper piece the bird in colorful designer paper! I also pieced the hat...which makes it so much easier to get it in the right spot. Jamie Sears nominated me for this blog award...Thanks Jamie! I am flattered!!! There are a few rules that go along with this award...but I will post those tomorrow. I hope you have a fabulous day! Thanks for stopping by!